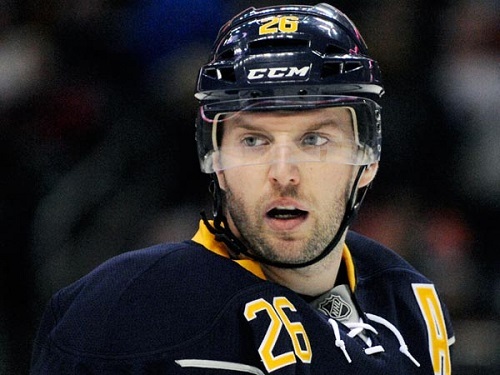 The New York Islanders have acquired Thomas Vanek from the Buffalo Sabres in exchange for Matt Moulson, a 2014 1st round pick, and a 2015 second round pick. Moulson, who turns 30 on next month, has a total of 233 points in 333 career NHL game, with all but 10 of those points coming with the Islanders. The 4 year “core vet” is in the last year of his contract and will enter free agency upon season’s end. Vanek, who will turn 30 in January, is in his 9th year in the NHL, spending every season in Buffalo. Vanek has posted 497 points in 598 career games. Like Moulson, the Austrian native will also be a free agent at year’s end. The value of the trade can be debated back and forth, but the one thing that can easily be taken away from this transaction is that general manager Garth Snow means business. This is a blockbuster deal that has shocked many, especially given the nature of the Isles’ GM. The only other example that can even come close in magnitude was when Snow dealt for Ryan Smyth a few years back. Snow has shown he is often cautious when pulling the trigger. Through drafting and executing smart, economical moves, Snow has built a team that has slowly gained some momentum. Garth Snow recognizes that this team has the ability to reach the second round of the playoffs, and the “core” deserves every opportunity out there to succeed. The time has finally come to cash in. Thomas Vanek brings his talents to Long Islander, where he can hopefully help the team build off last year’s playoff appearance. At first glance, it appears that the Isles added a piece that wasn’t necessarily needed. I agree, the Isles major cause for concern at this point is in their own end of the ice. As inconsistent as this year’s team has been, they have constantly shown they can put the puck in the net. Judging from the first 11 games, it looks like Kyle Okposo, Josh Bailey, & Frans Nielsen are poised to have career years. With that being said, the defense and goaltending has continued to leave Isles nation wanting more. Nabokov & Poulin have been very spotty so far, and the defense has already been decimated with injuries, most notably a concussion to Lubomir Visnosky. Sure adding Vanek may not help keep the puck out of our own net, but there is no denying the pedigree that he brings up front. Here’s how I think the deal played out: Snow knows his team has under performed to this point. Although at .500, the Islanders have left some easy points on the table so far. I think Snow was putting out feelers for a defenseman/goalie, specifically Ryan Miller in Buffalo. Anyone who plays fantasy sports knows how these deals shake down. Start high and see what you can get. Sabres GM Darcy Regier held the upper hand when talking about Miller. My guess is he wanted way more than what the Isle’s paid for Vanek. The Sabres’ gm actually commented that he and Snow have been talking about a deal for a few weeks. At some point the focus shifted from Miller to Vanek, and the terms changed. Snow saw the option, and although not an immediate necessity, the offer was too good to pass up on a legitimate first line winger. Matt Moulson has a great nose for the net and has built great chemistry with the team’s franchise player John Tavares, but truth is, the Islanders were not going to pay Moulson anything close to what he could receive on the open market. Moulson is due for a raise to around the $5 million a year area, and I couldn’t see Garth Snow making that deal. Whether he’s willing to give Vanek a longterm deal north of $7 million per year, quite frankly I’m not sure at this point. Snow has said that risk was worth it, given the depth of the prospect pool, and I completely agree. In the end, I’m extremely excited by this deal. Whether Vanek stays or leaves at season’s end, Garth Snow has now shifted the franchise to a “win now” mind frame that hasn’t been seen in a long time. If the team’s play continues to progress this year, and the Vanek move pans out, it’s tough to see Snow stopping here. The GM has proved savvy enough to know that he needs help on the blue line and in the net, but Thomas Vanek is a talent that could not have been passed up. The fans, the coach, the team, the “core,” deserved this move.